We know that a crystal lattice comprises of several unit cells. In a unit cell, every constituent particle( atom, molecule or ion ) has a specific and fixed position called lattice site. We can calculate a number of atoms/molecules and ions in a unit cell easily by analyzing the nature and position of constituent particles in unit cells. 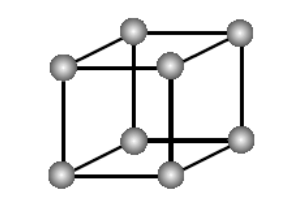 In the primitive cubic unit cell, the atoms are only located on the corners. That means 8 atoms are located on 8 corners of the lattice. Each atom located on the corner contributes 1/8th of the original volume of the cell. So since there are total 8 atoms in a primitive cubic unit cell, the total number of atoms in the primitive cubic unit cell. So there is only 1 atom in a primitive cubic unit cell. So there are total 2 atoms present in a body centred unit cell. In face-centred cubic unit cell atoms are present on 8 corners and center of all the faces. Also, each atom located on the centre of the unit cell is shared by two adjacent unit cells. Therefore only half atom belongs to a single unit cell. 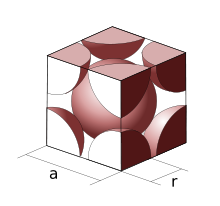 In end-centred cubic unit cell, 8 atoms are located on 8 corners of the cube and 1 atom each is present on two opposite faces of the cube. The table given below summarizes a total number of atoms present in a unit cell.